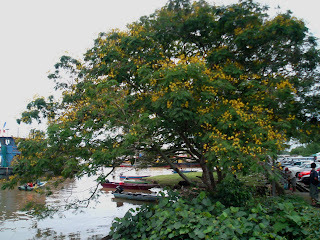 While shopping at the local 'tamu' recently (1-3-08) , I came across this flowering yellow flame tree, botanicaly referred to as peltophorum pterocarpum. This tree stands a few meters away from the 'tamu'( local jungleproduce market). Its large canopy makes it an ideal choice of rural farmers who park their long boats near it for the shade it provides,while they trade at the tamu. Rain by the Kemena River,Bintulu.